“Everyone dreads the whiteboard interview,” said Kristen Thayer. Thayer, a former educator turned Xbox software engineer, is referring to a common part of technology company interviews: candidates are given a coding or troubleshooting task, a whiteboard, and a marker and then asked to solve the problem in real time, in front of the interviewer. Though she was anxious about the whiteboard, Thayer was prepared for it. She’d just graduated from Kal Academy, a nonprofit coding academy for women and minorities and the brainchild of Microsoft employee Kal Viswanathan— who started as a HoloLens engineer and now works in Dynamics 365 for Talent. Thayer passed the test. She went from being a teacher to working at Microsoft in just under a year, and she attributes much of her success to Kal Academy. Kristen Thayer, a former teacher, learned to code at Kal Academy, a nonprofit started by Microsoft employee Kal Viswanathan. 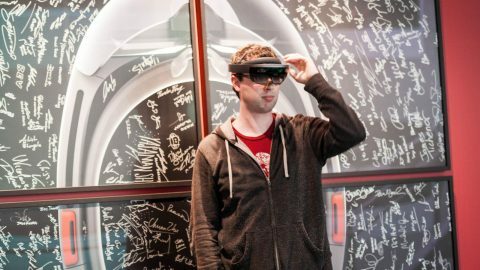 Thayer got a job at Microsoft in under a year after starting at Kal Academy. The academy’s students include mothers struggling to support their families, administrative assistants who dream of becoming engineers, and women who find themselves in jobs where they can’t advance. Viswanathan has story after story of graduates who were empowered to succeed by her training. One of her favorites is about a woman who wanted to take classes but couldn’t afford the expense, so the academy granted her a scholarship. This woman went on to study data science and land a data analyst role at a major retailer. Now, she also tutors other data science students. In this way, Viswanathan’s students are learning that the outcome of education isn’t just knowledge but an awareness of how an education gives a unique opportunity to directly help others advance in life. Viswanathan learned this foundational lesson from her parents early on. Growing up in India, Viswanathan dreamed of becoming a doctor. But she knew that neither she nor her parents, two middle-income teachers, would be able to afford medical school. “My parents bred teaching into my DNA, along with the lesson that I needed to give back to my community,” said Viswanathan. She eventually turned her aspirations toward computers and decided she would find a way to educate herself. So the resourceful Viswanathan brokered a trade: she found students around her who needed tutoring in subjects that she was good at and, in return, asked them to help fill in her computer skills gaps. “I taught math and science to kids in my neighborhood and asked them to teach me computer science,” Viswanathan recalled. It worked. Her early penchant for sharing knowledge continued through college and in her work at Microsoft. Over the course of her time teaching and working in computer science, Viswanathan noticed that something was off: the field of computer science suffered from a glaring lack of women and minorities. The few women she came across working in her field seemed to stay quiet, speaking up only when working in small groups of mostly women. Viswanathan refused to accept this as just the way it is. While working at Microsoft, Viswanathan was also teaching at University of Washington. A few students approached her, asking her to teach them privately. She started mentoring and tutoring women in small groups on nights and weekends in her garage. “[Women mentors] act as a ‘social vaccine’ that protects female students against negative stereotypes and gives them a sense of belonging,” according to an Atlantic article. As Viswanathan’s mentees were getting good jobs at good technology companies, Viswanathan saw the chance to help even more women. Word got out, and more people began to gravitate toward her warm and welcoming teaching style. In 2014, while working at Microsoft, Viswanathan started her own nonprofit organization, officially launching Kal Academy. “Microsoft encourages me to do these things, to make a difference in the world,” she said. 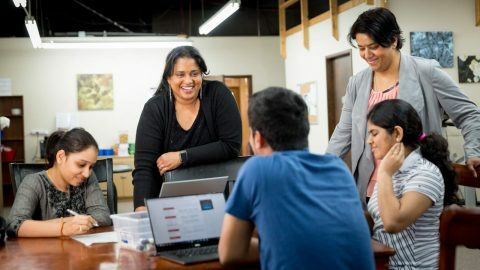 Viswanathan moved Kal Academy out of her cramped garage and into a small facility in Redmond, Washington, where she continues to teach not only the nuts and bolts of coding, but also—and perhaps most importantly—how to get a job in tech. This includes how to be confident in interviews and strategies for acing that dreaded whiteboarding session Thayer was worried about. “Women get to know how to face work every day, and they get to know how to learn new things if they’re just thrown at them, because ambiguity is one thing that we all have to get used to,” Viswanathan said in a recent podcast about women in business and technology. Since the academy’s inception, 200 of its students have landed roles at Microsoft, Amazon, T-Mobile, LinkedIn, and other companies. Kal Viswanathan (left) helped FastTrack Walaa Ibrahim (right) into a career in technology. Now, Ibrahim works at Microsoft. Viswanathan said that the energy she needs to keep up with the rigors of working full time during the day, solo teaching from 8 AM to 8 PM on weekends, and running a nonprofit is sustained by women such as Thayer and Ibrahim. Because she is a woman and a person of color, Viswanathan feels uniquely suited to motivate other women like her.